I read an article by the comedy site Cracked, titled “6 Board Games That Ruined It for Everyone”. Many people who play board games or work in the tabletop industry, commented on the story. We all talked about how we agreed or disagreed, many times offering replacements to Cracked’s suggestions. A few people on Twitter and Facebook asked for my favorites, and one of my friends is looking for kid-appropriate games. Until I put together my list, I hadn’t really thought about how family friendly these games can be. Of course, you’ll know if a game is appropriate for your child. Some can handle some light strategy, and some are in it for the silliness. And some for all of it combined. With that, I offer up my favorite 10 games, in no particular order. A note, however. The list changes as I discover new games. Also, feel free to offer up your favorites in the comments! Mille Bornes – This has been my favorite game for bazillions of years (because I am that old). I’ve been playing this game since I was a kid myself, and continue to love it. And not because I win it quite a bit. The game is easy to pick up and understand; it plays fast without heaps of pressure. Some folks say “That’s too old” and yawn over it. However, when I’ve brought this out in public, I get many comments on it. It’s mostly people who don’t call themselves “gamer”. One of the difficult parts in introducing new people to the hobby is that they don’t recognize anything. No one likes to look stupid, especially in a social setting. Mille Bornes is something many can recognize, if their only recollection is at grandma’s house. Oh, Gnome You Don’t – I admit, I love this game just based on the shiny silliness of it. I actually rarely win, but I’m usually the one teaching it. I first heard of this game from Gen Con, because I always talked to the women of Gut Bustin’ Games. They’re behind “Redneck Life” and “Trailer Park Wars”. This game is quite different from those. 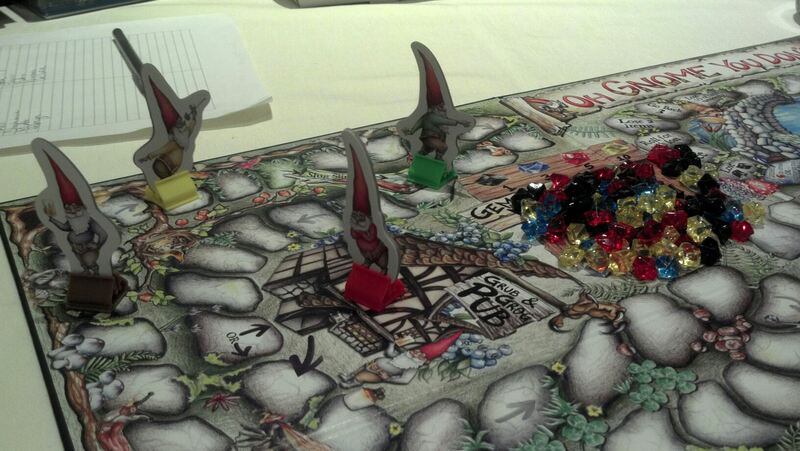 The game is a wee slow paced, which I’ve solved by using 2 dice to roll movement instead of 1. There’s a lot of great flavor text on the cards and within the rules, making it accessible to newbies. Tsuro and Tsuro of the Seas – I’ve been a fan of Tsuro ever since playing a demo at Green Lake Games. It’s a gorgeous game. I take it everywhere and teach it when I can. Tsuro is definitely one of my “gateway” games to introduce non-gamers to the board game hobby. It’s a pathing game, and easy to learn. There’s a lot more strategy in it once you’ve got a table of experienced players. That being said, it’s still a ton of fun to mix both newbies and experienced folk. I had always hoped for an expansion or an updated version. I got my wish! I didn’t realize they had done a Kickstarter campaign for Tsuro of the Seas until it was over. I saw @wilw tweet about it and set out to find it ASAP. I also wasn’t paying much attention to Geek & Sundry, so I wasn’t aware that one of the episodes of Tabletop featured Tsuro! All of a sudden, whenever it was out in public, people would remake, “Hey! I saw that on Tabletop! I’ve always wanted to play it!”. I have to say, I love the added complexity that Tsuro of the Seas has brought to the game. It is still good for teaching people about board games, but it does take a bit more to get going for newbies. Still, it’s one of those games that people of all ages can enjoy. 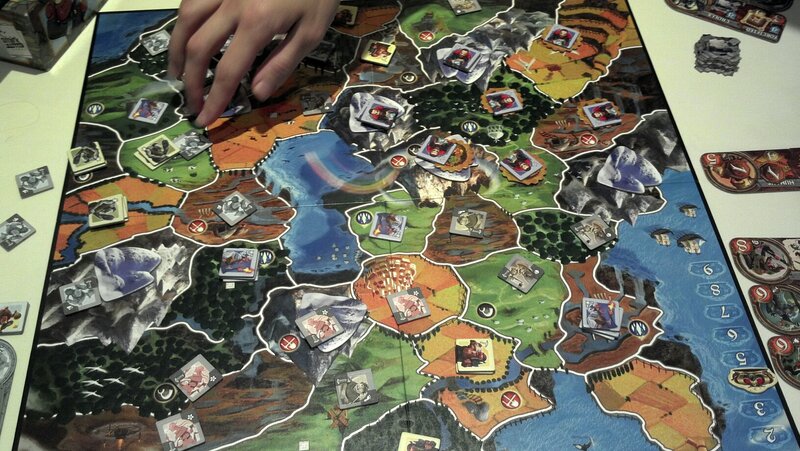 Small World – The description is great: “The fun, zany, light-hearted civilization board game”. It’s a good descriptor of the game, instead of “like Risk, but easier”. I don’t think it’s Risk-like at all! It’s engaging and easy enough to jump into, but yet has enough difficulty for regular players of board games. The replay-ability is huge, because the game always changes, thanks to special abilities and race not being linked together. Each race has its down ability, and the bonus ability is random. Flying Dwarves? Diplomat Skeletons? Yep! Last year at Kingdom-Con, I hosted a table for my game group. I spent 3 days playing nothing but Small World. Many had never seen it before, and just as many were quite experienced, but LOVED to play. I don’t think I’ve ever met anyone who disliked this game. It’s just a hoot. There are numerous expansions, and for added difficulty, a whole different base game called Small World: Underground. Here’s the Small World Tabletop episode! Dixit – I cannot say enough wonderful things about this game. We were first introduced it a couple years ago by our friend, Julez. The hubster liked it so much, that he ordered it online, while we were taking a snack break. We’ve gone through the first version, the expansion, the second version of the base game. We cannot get enough of the cards for this game. We tend to explain it as “It’s like Apples to Apples, but with pictures.”. It’s a bit different really, but the premise of a judge and submitting your match is similar. You just also have a points system, as your card is submitted along with everyone else’s card. They’re laid out and everyone has to guess which one is YOUR card. If you made the story/word/phrase too easy and everyone guesses? No points for you. If you make it too obscure and no one picks yours? No points for you. Plus, there are ways that people’s cards that DO get picked for yours get some points. The art is amazing, weird, and I’ve been able to use the same card numerous times, based on my audience. Just…go buy this one. Also, consider letting your kids play with you. It’s amazing for kids with vivid imaginations. You can always tailor the rules a bit more for the situation. 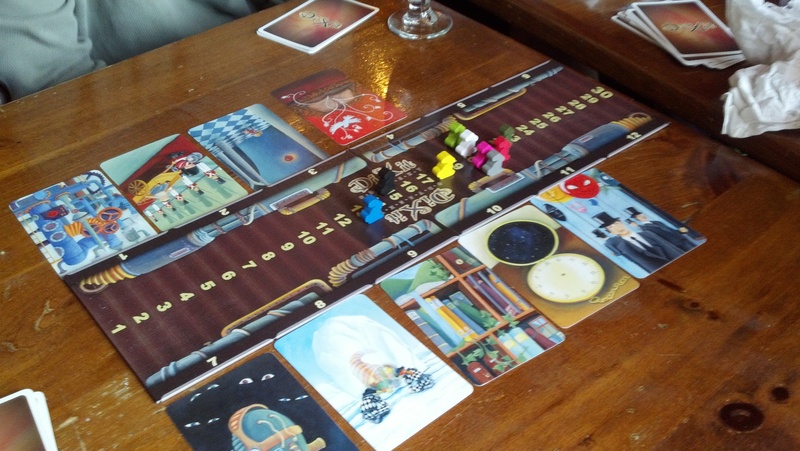 Oh, and here’s the Dixit Tabletop episode. Bakong – This review pretty much sums up what I like about it. It’s accessible, with just enough strategy to make it exciting for newbies. Many people tend to rush through to get the big fat emerald payout, but then realize it’s not who makes it back first with the big gem, but that those in behind can manipulate the tiles better to pick up smaller gems with more variety of scoring. The board is never the same, because you lay down each tile randomly when you play. The dice rolls and decisions from each player will determine how the board maps out through the game. I’ve seen it on shelves a bit here and there, so pick it up if you find it. Gloom – This is a game I don’t get to play often, and that’s a shame. It’s quirky and fun, especially for those with a twisty sense of humor. People can get pretty creative with the optional rule of storytelling when playing, which is part of the fun. The art and the cards themselves are gorgeous. There are expansion and even a Cthulhu themed set, found on the Atlas Games site. Writing all this about the game makes me want to play it again soon. Maybe once we get back to Seattle, the game will get more play in our board game day. And yes…we have a theme. Gloom was featured on Tabletop. Poo and Nuts! – This is where I admit that I’m 8 years old and the words POO and NUTS are hilarious. But really, these are great games. I’ve given away more copies of Poo & Nuts than I can count. I’ve given them away on airplanes, at conventions, and pubs. These are great quick games, and they’re easy enough for newbies & kids. Of course, there will be lots of juvenile snickering. That’s kinda the fun part. Playing over beers? A LOT of fun! The artwork is gorgeous, and draws in people to watch the game. I mean, c’mon. POO-FLINGING MONKEYS. How can you NOT have fun with this? Go pick them up; you can easy throw down a game or two randomly anywhere you are. 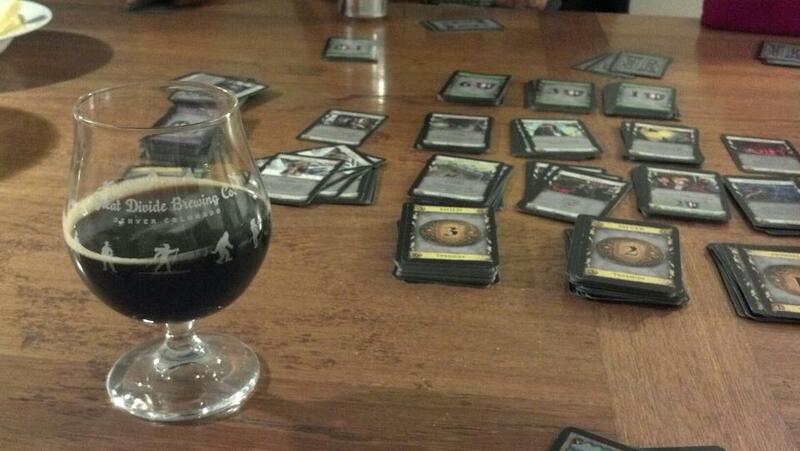 Dominion – This is the game which got me back into board games after a long absence. Deck building without the expense of buying decks of cards and booster packs. Everyone has an equal chance at winning. Even when you think you might be losing, you could easily be the one who wins. As an example, my mom was visiting us and we brought out Dominion to play. She’s stated she’s not good at games, but I beg to differ after watching her win and almost win in the two games we played. The game gets more complicated when you start adding in the expansions. I’m happy to play the base game all on its own, as you randomize all the cards used before each game. This way, the game changes not just with the cards on the table, but also changes based on who’s playing the game. When I first started playing, I won just about every game I played. Heck, after 3 play sessions of it, I entered a novice Dominion tournament. And came in 3rd place. Nowadays, I rarely win, but I still have a wonderful time every time I play. The game is newbie accessible, but it can be difficult for folks not used to deck building games. Another think I love about this being on the table, is that many of the people who love this game, do not steamroll newbies. That’s the best part about game groups. When you build a strong group of awesome people, they tend to be very welcoming to newbies. Also, once you understand the mechanics of this game, you can move on to other similar style games like Thunderstone and Heroes of Graxia. The Resistance – From the site, “The Resistance is a very intense social deduction game for 5-10 players. While it shares similarities with games like Werewolf, Mafia and even Battlestar Galactica, it has many very unique features such as a quick 30 minute play time, no moderator required and no player elimination.” I have to fess up. I loathe Werewolf and the like. I also must admit that have never played Werewolf. The reason? Some of the people who play Werewolf. Sadly, it’s because of experiences with the game and the people who play at game conventions which keep me away. It can be a completely disruptive game for those who are trying to play/talk near a Werewolf game. I have never heard this game played *quietly*. It needs a huge amount of space for the circle of people playing, which many conventions don’t have. Mind you, if the game is on the schedule ahead of time, it’s usually played away from other activities. It’s the spontaneous game which can prove to be vexing. Okay, back to The Resistance. 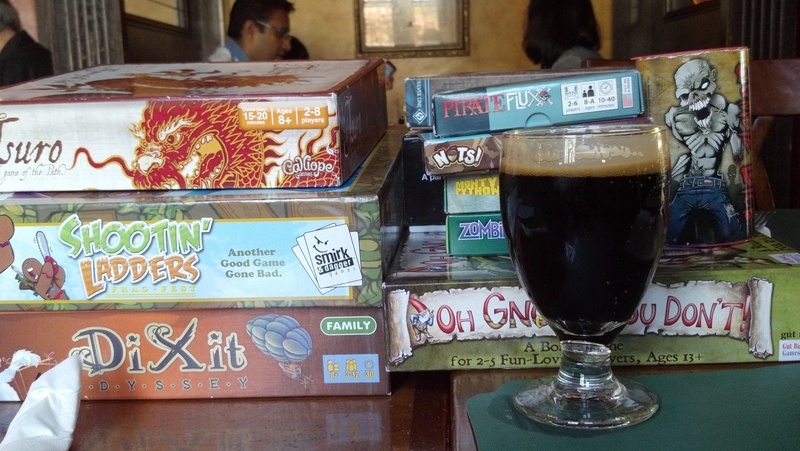 This was brought to my Beer Geek/Board Game day, and we had a *blast* playing. It’s best with a large group, and the guessing of the spies can take hilarious turns. I don’t know why everyone always thinks I’m the Spy. Or the opposite, people swear I can’t be the spy. I’ve got a pretty good poker face, and sometimes I am a Spy who sabotages the Spy win. Yep, trolling my own “team”. My deduction skills aren’t actually about the game play, so it’s interesting to watch people who use that as the ONLY way to figure out the Spy. I do by studying the people playing. That’s what makes it fun for me. There’s also a version of the game called The Resistance: Avalon which has more of a cohesive theme, and roles for people to play. I haven’t picked it up yet, but I plan to do so soon. So, what are YOUR favorite all-age appropriate games?